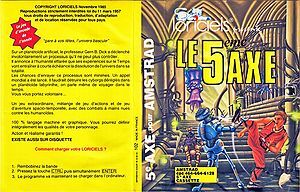 Difference between revisions of "Le 5eme Axe"
* This game is a port from a [[Thomson]] MO5 game of the same name. * It features some impressive raster effects, quite rare on CPC when this game was released. It was a way to reproduce the attributes from the MO5/TO7 version. * The game also includes some Sampled / digitalised sounds.